As the Grand Prix enters its 17th season, the first tour stop on the FIS World cup schedule will be Park City, Utah. 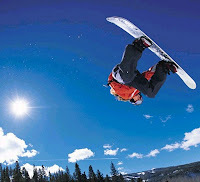 Park City will host the halfpipe event December 19-22, 2012. The Tour will hold a TTR 5 Star rating for snowboarding and the highest AFP rating of Platinum for freeskiing in halfpipe. Park City Mountain Resort has received over 2 feet of snow so far this season. Their opening day will be November 17, 2012. December 19: Freeski Halfpipe Qualifiers, men and women. December 21 Freeski Halfpipe Finals, men and women. December 20: Snowboard Halfpipe Qualifiers, men and women. December 22: Snowboard Halfpipe Finals, men and women. December 22: Paul Mitchell Progression Session. The Progression Session is a competition for snowboarders and freeskiers to show off their talents in a special venue of scaffolding, ramps, jumps and rails. Copper Mountain will host the next tour dates, January, 9-12, 2013.